Compared to the pashmina dress, this one was a breeze to put together– a welcome change! Things got a little fiddly when it came to piecing the bodice front– because the diagonal stripes on my fabric were not at a 45-degree angle, it was a little more complicated to mirror them at the center front. Since I had to cut the pieces on a slight bias (both of them, to get the V-shape I wanted), the edges were prone to stretching and wiggling out of place; after trying three times to get the V perfect, I declared that my result was *good enough*. Given the hassle in matching the V in front, I really didn’t want to have to deal with matching the stripes on multiple pieces for the back to make purely decorative curved back seams. This was particularly true since I was going to have a drawstring back that would mostly obscure those very same seams. I decided to just cut the back pieces as one so I could dispense with the piecing and just worry about matching the diagonal stripes along the center back line. This past year at Costume College 2018 I had a great time in costume, not only at the evening events but also during the day, when I wore my green 1920s dress and my pink cotton Regency dress. They were both cool and reasonably comfortable, which is definitely something I’m going for in future daytime outfits. I also had the vague idea that I’d like to start wearing more outfits that lent themselves to interesting poses or props, the better to take fun pictures with people (so many of mine are boring!). It’s no wonder, then, that in the middle of a random conversation about costumes and period-looking eyeglasses that I was struck with an inspiration for a fun daytime outfit– Mary Bennet, the third Bennet sister in Jane Austen’s Pride and Prejudice. Mary’s primary defining characteristics in the book are being plain (compared to her prettier sisters), moralistic, and terrible at singing/playing the piano. Her father teases her by calling her “a young lady of great reflection,” and she is described as having “a pedantic air and conceited manner.” She frequently “makes extracts” from books she has read, and tends to offer them at inopportune moments. 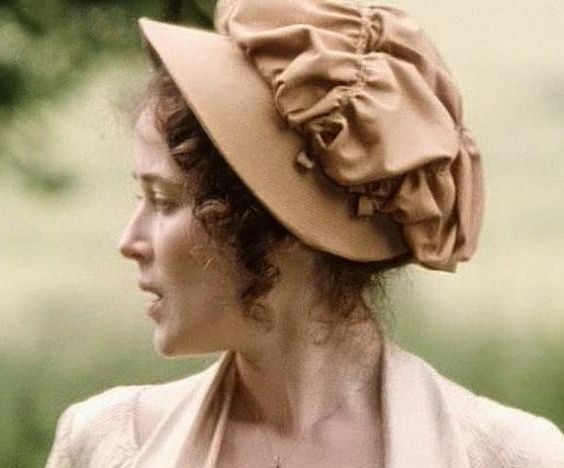 In the movies she is often depicted as wearing spectacles and extremely drab clothing, and in fanfiction she frequently reads from Fordyce’s Sermons to Young Women, though in the actual text there is no mention of spectacles and Fordyce appears only once, as read by Mr. Collins. 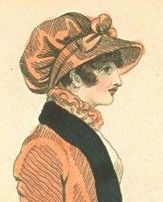 I decided that Mary would make for a fun character to play– I’d be able to stare disapprovingly over my spectacles at people and quote ridiculous lines from Fordyce, and best of all I’d be able to wear comfortable Regency garb all day! Unfortunately, all of my Regency gowns are a bit too colorful to suit my idea of Mary, so I had to make a new one. 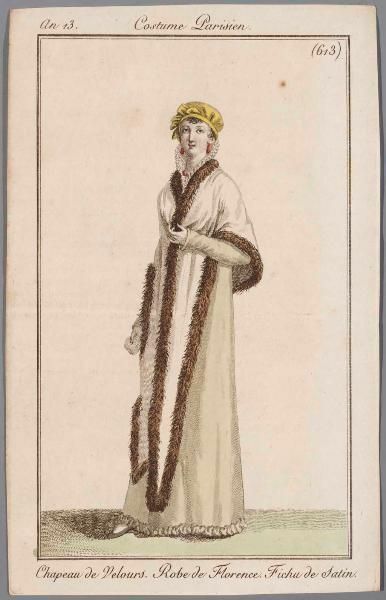 As part of my Regency wardrobe, I wanted to make a white chemisette to fill in the necklines of some of my gowns– most notably the pashmina gown, which I specifically made for daywear. Taking my cue from several other bloggers, I started off with the chemisette pattern A from Janet Arnold’s Patterns of Fashion I. It has a mostly-plain front with some tiny tucks at the shoulder line (not pictured in the illustration but they’re there in the instructions), and a triple-layered mushroom-pleated collar. I did end up making a few structural edits– I widened the base width of the back, which otherwise would’ve been oddly pointy (and would not have matched the illustration at all), and did only two ruffles at the collar since my fabric was a bit heavier than what would’ve been used back then. And I didn’t bother cutting the neck band on the bias because it seemed wasteful and other chemisettes in the book had their neck bands cut on-grain, so it didn’t appear to be crucial. Anyway, not having any graph paper on hand and not feeling inclined to figure out how to print out different sections of the original scanned pattern on different sheets of paper, I used a good old ruler and my knowledge of geometry to draw out the pattern for the chemisette. Honestly, I wouldn’t have done it if the pattern weren’t so simple, but at least on this occasion it worked out well. The main body went together easily– I did a narrow double hem on the open sides and made my drawstring channels on the bottom with no problems. Then I had to figure out how to handle the neck ruffles. To go with my fur-trimmed wrap I needed a hat to wear outside. Unlike all of my other bonnets, however (which are made of straw), this one needed to be winter-appropriate, so I took out my extra velvet fabric and got started. I picked up a basic cloth-covered sun-hat at Goodwill (brand new, tags still on! ), mostly to use its nice, wide brim. 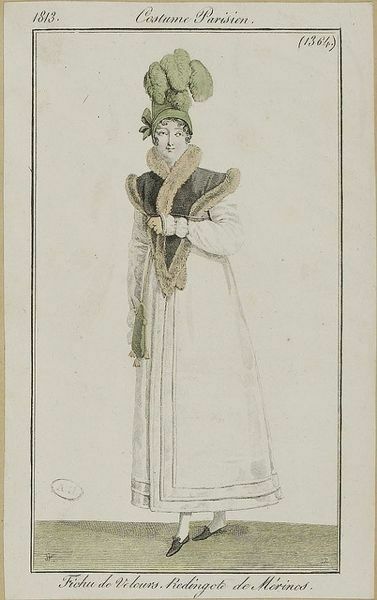 To go along with my winter Regency pashmina gown, I needed some winter-appropriate outerwear to take with me on the sleigh ride. However, I wasn’t up to sewing a pelisse from scratch in my limited timeframe, so I decided to wear a modern full-length black wool coat and just add a fancy fur-trimmed wrap to wear over it. I wasn’t ready to learn how to sew real fur pelts, so at first I looked into faux fur; but when I added up the cost of an appropriately luxurious faux fur (the good stuff is expensive! ), an outer layer, a lining, and an inner layer for warmth, it seemed like an awful lot of effort and money to sew something from scratch. So I decided to cheat.